English edition of this book is available. 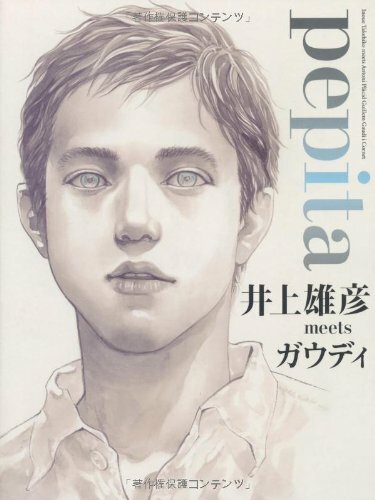 pepita is an interesting project of 井上雄彦 (Inoue Takehiko) where he traveled to Spain to explore the works of Spanish Catalan architect Antoni Gaudi. It's a collection of sketches he drew on location, some impressions of the people from the past, and other assorted sketches he overlay onto the photos taken. There's a lot on Spanish architecture and much on the history but everything is written in Japanese. This book is actually a limited edition. A 108-page hardcover that comes with a DVD (region code 2) and several calendar cards feature the art in the book. There's a pepita facebook page that you can also check out. This is the book trailer. Below are some videos from the DVD. 「"pepita" 井上雄彦 meets ガウディ」DVD chapter 5 "ガウディの生家"
「"pepita" 井上雄彦 meets ガウディ」DVD chapter 7 "職人魂"
「"pepita" 井上雄彦 meets ガウディ」DVD chapter 14 "元模型職人"
I am an Arab .. We are tired of Mickey Mouse and Superman and Batman .. Etc. There are lots. Just search for them on google and you'll find plenty. There are also original manga's created by arabs (UAE magazine), I forgot what it's called. You might wanna check this anime, too, called "Torkaizer". It was created by a guy from the emirates.